"Throwing back that perfectly frosty pint of beer is a must-have for getting the best taste and quality. These awesome self-chilling beer glasses allow you to serve beer and other beverages, and maintain a cold temperature until you're done drinking. Just freeze the reusable inserts, and place the frozen insert into the bottom of the glass. 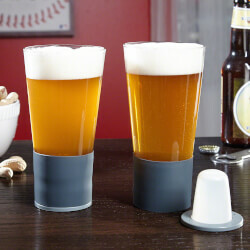 The insert is magnetically held inside, turning your glass into that perfectly chilled classic pint glass. These hand blown, self-chilling beer glasses include an insulated hand grip, further helping maintain beverage temperature. Great when used as a pint glass or highball for cocktails, each measures 6.75 tall with a 3.5 diameter, and holds 22 oz.Made of hand blown borosilicate glassIncludes 2 reusable chiller insertsComplete set of twoEach measures 6.75"" tall & holds 22 oz."